A Kindle Case with light built-in could be the most essential accessory for Amazon’s Kindle hardware. Whether you get the Kindle with WiFi, the Kindle with 3G and Wifi, or the much larger Kindle DX you will definitely find occasion to read in bed. The best way I’ve found to make reading in bed with the Kindle pleasant is a Kindle case with built-in light. After largely ignoring the case market with the first two versions of the Kindle wireless reading device, Amazon did an outstanding job of creating the Kindle LIghted Leather Cover to compliment the new version of the hardware. The light tucks neatly into the top right corner of the case, to the point you don’t even notice it’s there. The bulbs in the light are LED, which means they will probably outlast the device. No separate power is required; the light derives power directly from the Kindle through the two hooks used to connect the case to the Kindle. 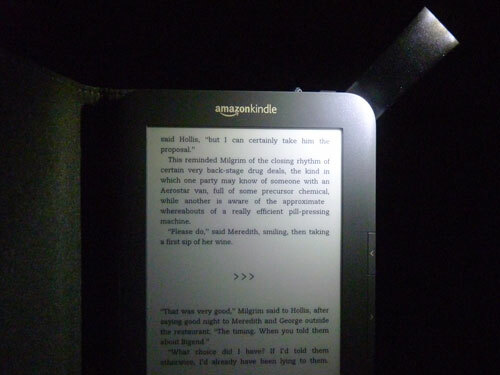 An elastic strap is used to keep the Kindle from accidentally falling open between uses, which is an important means of protecting the screen from damage. With seven colors to choose from, this is definitely a must have compliment to your ebook reading experience.